Hi-Ho Blogger! The Rare Stuff rides again! To kick things back off in style, here's an album it's unreasonably hard to find online -- the third long-player from Hoboken's favorite sons, The Smithereens. It's called 11 because the band hired producer Ed Stasium to beef up their sound, which prior to that had been a bit indie-flimsy. As the liner notes say, a la Spinal Tap, "this one goes to eleven..."
This is, without a doubt, my favorite Smithereens album. Though they most certainly rock, the heavier first two numbers, which most show Stasium's influence, are not my favorite tracks of the bunch. But once the lovely, baroque strings of "Blue Period" kick in, I'm along for the ride. Pat DiNizio's and Belinda Carlisle's harmonies on that number are also exquisite. "Baby Be Good" and "Yesterday's Girl" are sweet, smart pop songs, and "Room Without a View" has the undercurrent of tension of classic, earlier Smithereens cuts like "Blood and Roses" and "Behind the Wall of Sleep". "Cut Flowers" is an adventurously structured and arranged short story in song. Speaking of short stories, "William Wilson" takes its name and paranoid atmosphere from the Poe tale of the same name. The thoroughly delightful "Maria Elena", meanwhile takes its name from Buddy Holly's widow. Closer "Kiss Your Tears Away" is an heart-tugging romantic ballad. The whole thing clocks in at an economical 34 minutes, just like the perfect '60s pop album. The Smithereens' catalog is long overdue for a rehaul. If and when this fine collection is reissued, you'll wanna dump these tracks and upgrade. Meanwhile, though, this late-'80s power-pop high point deserves to be heard. UPDATE 12/27/10: Link removed due to new information that this album is available for purchase at the Amazon MP3 Store, HERE . You're right, it IS hard to find. Thank you. Any chance you have "Blow Up?" Hsere's something I wrote about "11" a little over 2 years ago. I bought this CD when it first came out, and have loved it ever since. Didn't realize it was so hard to find. Thanks for helping out those who didn't have it! No idea, was investigate about Cobain. Sounds like uninspired pop. If you do not knew - like me (sry, not bad english, not native ;o) dont download it. Sounds like 1000 boring Popgroups. Sal - I remember that piece! At the time it inspired me to look for it online, but I couldn't find it. Hence, finally, this post. So I guess it comes full circle with you mentioning the article in the comments! I just finally acquired the CD (again, hence this post). All these years, I only had it on -- gasp -- cassette! Oh, and Troy, the CD itself isn't hard to find, it can be had for a penny! It's hard to find as a download online. Great blog and great to see Sal here too. I yearn to get the 21cd thing but I'm not paying the silly prices, chancers are asking for. Let down twice on it as I ordered it, just as it was pulled. Great to see you giving The Smithereens kudos. I've been a fan of them for a long time. I purchased this when it first came out on disc lo those many years ago. I'm not sure why they caught my attention, but they did and I've been enjoying their music ever since. Thanks for sharing this with others PC... it is one that should be heard. I can't for the life of me, figure why Anonymous above says it sounds like 1000 boring Popgroups. His loss. So here we are, celebrating this perfect little release that still stands up after umteen listens from Hoboken's Next Best Export. As this was released in 1989, with the homage to Hoboken's Best Export's throwaway film "Ocean's 11" on the cover, I've always wondered if Soderbergh was listening to this one night and got up and called George and Brad and said, "I got an idea. What do you think about doing an update of..."
Thanks for the gift that is playing on the MacBook right now. Thanks for all the great responses, folks. Gene, I love the Soderbergh-inspiration theory! BB, that's a totally legit opinion, many do prefer the first two albums. @Reggie, first comment, I do have Blow Up. I think it's a bit of a step down from this, so wasn't thinking of posting it, but given the response to this I just might. anything -- I see your blog is invite-only, I'd love to check it out if you'd allow! One of the best albums of its time. Love your site! Let em know if you want to trade links. Nice album, I first bought it on cassette, later on CD, although must admit that I haven't played it in a long time. If anyone is interested I've got several other Smithereens albums, just let me know. No probs on blog - just let me know how I can email you an invite or if you are in touch with Sal, he's got my email address. Hello, found this post via other blogs. This is indeed a great album and great band. I happened to see them live on this tour and it was a killer show. I believe the 'solo' on Blue Period live was played by Mike on bass. We met the band (sans Pat) after the show and they were very nice, very down to earth. 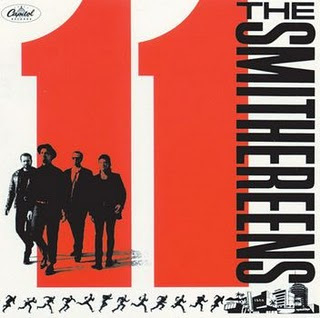 By the way, 11 can be purchased from Amazon's MP3 store: http://www.amazon.com/Smithereens-11/dp/B000UFRQMA/ref=sr_shvl_album_1?ie=UTF8&qid=1293329898&sr=301-1. -a live EP put out by an indie label before Green Thoughts. It included some killer live versions of Blood and Roses, and Behind the Wall of Sleep, along with a great cover of The Who's The Seeker. -their performance on Saturday Night Live of A Girl Like You and Blues Before and After (the latter featuring some killer guitar solo work from Pat).